For your safety and enjoyment at Sea Life Park, please carefully read all of the text below. Failure to follow any of the regulations, conditions and instructions set forth below may result in serious injury to yourself or other individuals. Individuals not following Park rules and safety instructions, will be subject to immediate ejection from the Park without refund. Safety is always #1 at Sea Life. Our goal is to accommodate all guests to enable them to fully enjoy our Park. Park Safety Standards – General Principles. Please understand that people may be excluded or removed from certain attractions, areas of the Park, and/or certain activities, in the interests of safety as determined by Park personnel. Be Alert. Please watch where you are going. 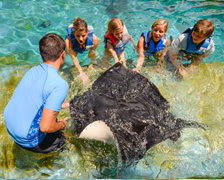 Aquatic animal parks are crowded places with many distractions and wild life. Please be alert to your surroundings, including elevations in surfaces, wet and slippery surfaces, uneven ground, stairs (which may be wet and slippery), landscaping, tree roots, rocks, man-made structures, patron possessions left lying around the park or in pathways, etc; this is the open, obvious and inherent nature of an aquatic animal park environment. A Watchful Eye for Those in Your Care. If you have MINORS or others with DIMINISHED MENTAL CAPACITY under your care (including ADD, autism, dementia, etc. ), please understand your special duty to monitor their activities at all times, and be particularly watchful to ensure their safety. 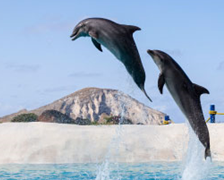 Assist with stairs, for example, and ensure that they do not come too close to, nor enter, any water feature unless it is part of an organized dolphin swim or other staff-supervised activity. Always be aware that water features present drowning HAZARDS. Drowning or near-drowning accidents can occur rapidly. The Park disclaims all liability, and shall not be held liable in any manner whatsoever, for any trip, slip, and/or fall, you and/or any minor(s) or others in your care may suffer, nor for ANY INJURIES caused from WALKING, FALLING, OR STUMBLING into/onto objects or structures, including slip/falls down steps, or into water features or decorative features. By entering Sea Life (including its parking lot, surrounding areas and all places within the Park), you automatically agree to this waiver of all such liability. No Running. Running poses a collision, trip, slip and fall hazard, and is rude to other guests. It is strictly prohibited in all areas of Sea Life, and may be especially dangerous on stairs or in stadium seating. Please realize that all areas of an aquatic park are prone to being wet and slippery. Parents/guardians are responsible for ensuring that minors and others under their care do not run in any area of the Park. Slippery Surfaces. Sea Life is an aquatic park, and it is expected that there will be wet areas, including on stadium stairs, walkways, etc. In addition, please be especially careful in bathrooms, on and around any water attractions, and in cafes or food areas; all of these areas are prone to becoming wet and slippery. Dress for Safety. No loose/oversized/baggy clothing or accessories which are not thoroughly secured to your person, or any carried items, which may pose a hazard. Prohibited items may include, without limitation (depending on the specific activity), any form of headwear, scarves, long belts, fringed materials, high heels, loose footwear, wigs, purses, backpacks, or any dangling fabric. If you choose to wear unstable, loose or ill-fitting shoes to the Park (e.g., high heels, flip-flops, clogs, loose sandals or Crocs or slip-ons, etc. ), realize that you are creating a hazard for yourself in a crowded park, and you may not be able to partake in certain attractions. We urge you to wear secure, comfortable footwear. No Monkeying Around. No climbing on or hanging from, any structures, trees, lamp posts, wiring, door frames, rain gutters, etc. We are an aquatic animal park, not a jungle gym. Be Seated – Carefully. Benches and chairs are for sitting only—not walking on, jumping on or over, nor standing on. If you are obese, or especially large and heavy, proceed with caution when sitting, and check the chair/bench’s stability. Multiple persons should never share the same single-person chair. Be especially CAUTIOUS when walking up and down stadium seating; take your time with each step do not step up or down if people are in your way. Caution! – Stadium Stairs and Benches. Walk up and down the designated steps, and do not walk up or down upon stadium bench seating. First, there is a greater elevation from bench to bench, than with the designated stairs. Secondly, benches are more narrow than stepping upon the designated stairs. Therefore, walking up or down the benches presents a greater hazard than using the designated steps. No “Sitting on the Fence” … Literally. Fences, railings and banisters should never be leaned on, sat upon, stood upon, twirled on, or jumped/vaulted over. Doing so causes damage to Park property and people cause significant injury. Stop! Parking is reserved for Safe Drivers. Parking lots are, by their very nature, hazardous places where you must act cautiously and pay attention at all times for yourself and those in your care (minors, elderly needing assistance, disabled persons, those with mental disabilities, etc.). Please drive slowly and carefully at all times (including into and out of parking spaces, or when entering or exiting the lot), realizing that children may be running about, that elderly or disabled may not hear or see your car, etc. In no event shall Sea Life be liable for theft, break-ins, car collisions or other property damage/loss, and the Park has no liability for anything occurring on public roads. Watch & Learn – Animal Interactive Programs. Before engaging in any animal activity, please make sure to first observe the animals, read any signage carefully, listen to all staff instructions or other commentary and ask questions if you have any concerns. If anything makes you uncomfortable about participating in a dolphin interaction, please do not participate. Dolphins (and other animals such as fish and seals) are wild animals. They will not always act predictably and they may act out aggressively. Thus, there are inherent hazards of engaging in any animal interactive program. If you do choose to participate, realize that you are ASSUMING ALL RISKS and waiving your right to make any claims against the Park. Waiver Required – Animal Interactive Programs. 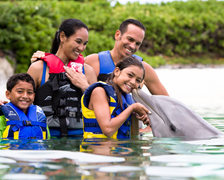 It is required of all participants to first sign a waiver & release of all liability, before you will be permitted to engage in an animal interactive program such as swimming with the dolphins, reef encounters and seal swims. 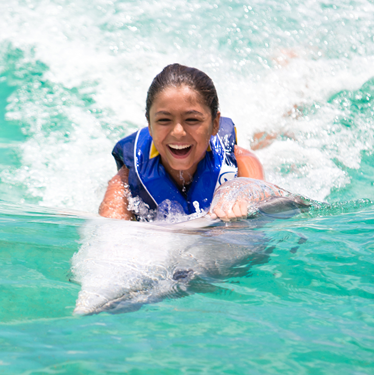 Attractions and animal interactions at our Park can provide our guests with wonderful memories and exhilarating fun! But amusement and water rides also can be adrenaline-pumping activities which put substantial strain and forces on your body and senses, through rapid acceleration, speed, sudden movements, and the unpredictable motion of a ride, which may thrust your body about in different directions, causing muscular strain and stress on your body such as on your neck and back, and accelerated heart rate and blood pressure. DO NOT PARTICIPATE IN ANY INTERACTION PROGRAM, IF YOU ARE UNDER THE INFLUENCE OF ANY ALCOHOL, DRUGS (WHETHER LEGAL MEDICATION OR ILLEGAL SUBSTANCES) OR OTHER SUBSTANCES WHICH MAY AFFECT YOUR HEALTH, SENSES, AND BODY REFLEXES AND COORDINATION. DO NOT PARTICIPATE IN ANY INTERACTIVE PROGRAM, IF YOU HAVE ANY HEALTH CONDITIONS OR PRE-EXISTING CONDITIONS OR INJURIES, OR IF YOU ARE TOO AFRAID TO PARTICIPATE, INCLUDING WITHOUT LIMITATION HEART, NERVE, MUSCLE, BACK, NECK, BONE, JOINT, LIGAMENT, TENDON, BRAIN, EYE, EAR, OR OTHER AILMENT OR INJURY (PAST OR PRESENT), OR IF YOU ARE PREGNANT, MAY BE PREGNANT, OR HAVE HAD SURGERY IN THE PAST FEW MONTHS, OR IF YOU ARE STILL RECOVERING FROM ANY ILLNESS OR MEDICAL CONDITION, TREATMENT OR PROCEDURE. ONLY YOU CAN DETERMINE IF YOU ARE HEALTHY ENOUGH AND FEEL GOOD ENOUGH TO SAFELY PARTICIPATE IN AN INTERACTIVE PROGRAM. THE PARK DOES NOT, AND CANNOT, GUARANTEE YOUR HEALTH, AND YOU FULLY ASSUME ALL RISKS OF ANY ACTIVITY IN WHICH YOU CHOOSE TO PARTICIPATE, AND BY YOUR PARTICIPATION YOU WAIVE ALL RIGHTS TO MAKE ANY CLAIM OR DEMAND FOR DAMAGES, OF ANY KIND WHATSOEVER, INCLUDING WITHOUT LIMITATION FOR INJURIES CAUSED BY AN ANIMAL OR IN RELATION TO DROWNING HAZARDS. Each guest at our Park has legal and moral obligations to act responsibly when visiting our Park. Each guest must, at all times, act in a reasonable, responsible manner to safeguard one’s own health and safety, and refrain from anything which poses a risk to others. Carefully read and obey all warning signs and instructions, attendant instructions, and recorded safety messages. To the extent possible, observe animal interactions before participating. Watch where you are walking. Do not do anything to harass, taunt or harm the animals. Remember – safety is a shared responsibility! The Park can only do so much to keep you safe—it is up to you, as well. We can’t protect people from the consequences of their own (or another’s) reckless or irresponsible behavior. If at any time you feel you need help due to an injury or other medical concern, please immediately notify a Park staff member and ask for help. Please note that the Park is not a medical facility and does NOT provide medication, insulin, or other medical treatments or devices, other than basic first aid; please plan your visit accordingly. Be safe and have fun! Wet weather (including mist, humidity, rainstorms, flooding, etc.) makes surfaces slippery. On wet days, please exercise extra-caution when moving about the Park, especially going up or down stairs (hold handrails), walking up or down stadium steps, using bathrooms, etc. Avoid stepping into streaming or puddled water, since it may carry mud or other debris, posing a slip hazard. In certain severe weather situations, the Park may cancel shows or suspend programs, and on occasion, shut down the entire Park. Please make sure to obey all Park instructions, if any are given. Use sunscreen on exposed areas of your body. Reapply frequently. If you have been in the sun for prolonged periods, or if it is especially hot and/or humid, take breaks as needed from your outdoor activities, and relax in a shaded or indoor area to allow your body to cool off. Drink water to hydrate. Children under 13 years of age may NOT be at the Park without adult supervision. Regardless, we strongly recommend that minors (under 18) be accompanied by an adult. The Park does not assume any responsibility or liability for unattended minors; children and the behavior of all minors are the sole responsibility of their parent(s) or guardian(s), and parents/guardians may be held legally liable for all acts of (and damages caused by) the children under their care. Please make sure that minors act responsibly, and in consideration of others, at all times. For example: No running; no twirling on banisters; no climbing on structures, or sitting on fences; no “horseplay” (e.g., wrestling, gymnastics, playing “tag,” throwing rocks or other items at each other, etc.) especially in the show seating areas, near the animal habitats, in food areas, near picnic tables, or other attractions (such as the Sky Trail climbing attraction or Salty’s Pirate playground area). Park does NOT Assume Responsibility for Minors. Please remember that the Park is NOT a daycare facility. Anyone choosing to leave their minors at Sea Life is nonetheless still responsible and liable for them. In no event does the Park assume responsibility for minors. Minors in violation of Park rules may be ejected or detained, in the Park’s discretion, as evaluated in a case-by-case basis. While the Park may in good faith attempt to contact a minor’s parent/guardian to have them picked up, this is done out of concern and courtesy, but in no event will the Park be held responsible if a minor leaves the Park, or for anything occurring after a minor has left the Park grounds, by whatever means. We greatly appreciate your help in responsibly monitoring and controlling any minors in your care. Shoes and clothing appropriate to a family-friendly, aquatic animal park, are required at all times (e.g., shirts required, all “private” body areas must be appropriately covered, and it is prohibited to wear see-through clothes or sagging pants which reveal undergarments, buttocks, breasts or “private” areas). Appropriate “public” clothing is required. No pajamas, bath robes, lingerie, indoor slippers, costumes of any kind, etc. Masks, horror, or Halloween-style attire is not permitted, as well as any clothing which depicts or encourages violence. (Note: For special events, the Park may make exceptions. In any such event, the Park will provide details on what is acceptable for the respective event). The Park may prohibit any jewelry that may pose a hazard to animals or other guests, or to property. Prohibited items may include: Bulky, protruding or dangling jewelry (e.g., large hoop earrings which could snag on something, long necklaces which can pose a strangulation hazard, bulky rings, and any piercings that could snag or catch on equipment, or harm an animal). The Park strives to make your experience a happy one, in all respects. Unfortunately, there is no way that we can erase the wicked intent of some people. Therefore, please understand that the Park cannot, and does not, guarantee your personal security or that of your personal property. In no event will the Park be held liable for your lost, stolen or damaged possessions. The Park does not have lockers; plan your trip accordingly. It is the unfortunate truth that at Sea Life or at any other locale in society, no amount of security can prevent people from acting in a criminal manner if they are intent on so acting. The Park can only try to reasonably watch over the premises and the people therein, and respond in a professional manner to any security threat or incident. Personal. Guests are welcome to take pictures of themselves, their friends and family, their group, and the scenery in general, for their own personal use. However, NO cameras of any kind (including cell phones) are allowed in conjunction with any animal interactive activity, because such items pose a safety hazard. In addition, no one is permitted to take photographs of others who object, or which violate another’s privacy, rights to publicity, or which are harassing, stalking, or threatening. Image taking or recording of other peoples children is strictly prohibited, under all circumstances, as is any image taking in bathrooms and changing rooms; violators may be held for law enforcement. Use of drones (in, over, or around Sea Life), whether for photographic purposes or otherwise, is strictly prohibited (unless the user has been granted written, contractual permission for that specific instance from an officer of Sea Life or its parent entity). Violations may subject the user to immediate ejection, confiscation of the drone, and referral of the matter to authorities. 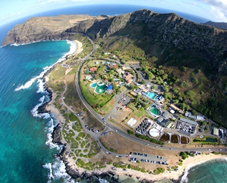 Drones are a serious safety hazard to park operations (including electrical facilities), and to Sea Life’s guests, personnel, animals, and wild life. 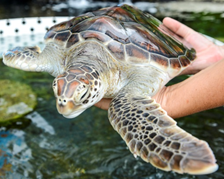 Use of drones in, over or around Sea Life, also constitutes an illegal trespass, an invasion of Sea Life’s privacy, and a tortious interference to our operations. In any event, guests may bring personal foods into the park, to the extent that they are medically necessary (e.g., for diabetics, baby formula for infants, gluten-free foods, or allergy-safe foods for allergies). Guests may not bring alcohol into the Park. Political activities, fundraising, demonstrations/protests. or any organized or group religious practices or rituals, are prohibited at Sea Life. In general, Sea Life prohibits other activities not related to an aquatic animal park, such as exercise classes, athletic team practices, unauthorized commercial activities, or any other activities which do (or may) interfere with, or threaten, park operations, guest attendance/entrance/exit or enjoyment, safety, security (to persons, animals or property), or traffic flow into/out of/around the park. In the interests of safety and security, protests/demonstrations must be outside of the Park’s property and at least 500 feet away from all park entrances/exits. Protests and demonstrations are subject to additional restrictions as may be provided by law or as directed by law enforcement. Violators of the foregoing rules will be subject to immediate removal from Park premises and possible action by law enforcement.